Most entrepreneurs have very personal views around the importance and role of options. If you are looking to have US employees with UK options this can create some complexity which is worth understanding in advance. Vesting — the time after which an employee can exercise options. Typically a vesting schedule will specify that of the granted options a proportion will vest, and can be exercised in increments. For example for 100 shares on a four year vesting schedule; 25 shares can be exercised at the end of year one, two, three and four. Most UK founded companies launching in the US will have a wholly-owned US subsidiary. As a result, most employees, whether UK or US will want to have options in the US parent company as that is where the ultimate value will be. This structure of option pool is the most common from what we have seen. The complexity of having US employees with UK options, comes from ensuring that it is structured so that it remains tax efficient. US permanent employees will be governed by US tax law irrespective of where the parent company is. In the UK, the EMI (Enterprise Management Incentives) scheme shields UK employees from capital gains taxes up to certain thresholds. The US equivalent is an ISO (Incentive Stock Option) and has similar intentions as EMI but is unfortunately less tax friendly to the recipient. HMRC has a specific process for establishing what is deemed an appropriate exercise price for options. The IRS (US Internal Revenue Service) has a different process. The challenge arises when trying to synchronise the exercise price in both geographies as otherwise you will be incentivising employees holding the same number of options differently across the organisation. Where this inequality has happened, it has been a sensitive issue to remedy which could be avoided entirely with adequate planning. Under the EMI scheme a company can “self-assess” to set up the plan and HMRC should be notified whenever options are granted. There are annual limits for participants and a restriction on the total value of options in the pool. The exercise price must be agreed with HMRC in advance to ensure that the tax breaks are achieved. The exercise price for ordinary shares (typically the share class for options) can be at a discount to the share price for preferred shares and this discount is can be up to 70% or more. The valuation methodology and calculations are normally sent to HMRC as part of a short one to two page letter. HMRC valuations are typically refreshed after a funding round or if company performance materially changes. HMRC valuations can only be agreed when new options are to be issued — HMRC will not do “speculative” exercises to try and gauge a likely price. One pre-requisite for an option plan in the US is a company valuation (409a valuation). In addition, at the time of each option grant, companies will need to update the 409a valuation. This can be done in-house but it is advised that companies outsource this. If a company completes the valuation in-house and the IRS scrutinises the option scheme, the onus is on the company to prove the methodology. If the 409a is done externally, the burden of proof is on the IRS who must disprove it. A 409a is typically a 10 page report with supporting calculations and methodology. If the valuation is conducted externally by a third-party this is typically completed by a specialised assessor or accountant. This can typically cost $2–5k for a full valuation exercise depending on the complexity. Some banks such as Silicon Valley Bank also offer this service — contact details below. Ordinary income tax rate was between 10–39 per cent. For companies that already qualify for the UK EMI scheme, many will also qualify for treatment as an ISO in the US. This is however worth checking with your US lawyers. When employees exercise their option grants, this will attract tax. For an ISO this can be in the form of AMT or for NSOs this will be Ordinary Income Tax. Typical employment contracts restrict employees exercising their options beyond 90 days from termination which can amplify the tax impacts as a decision to exercise options must be made promptly. 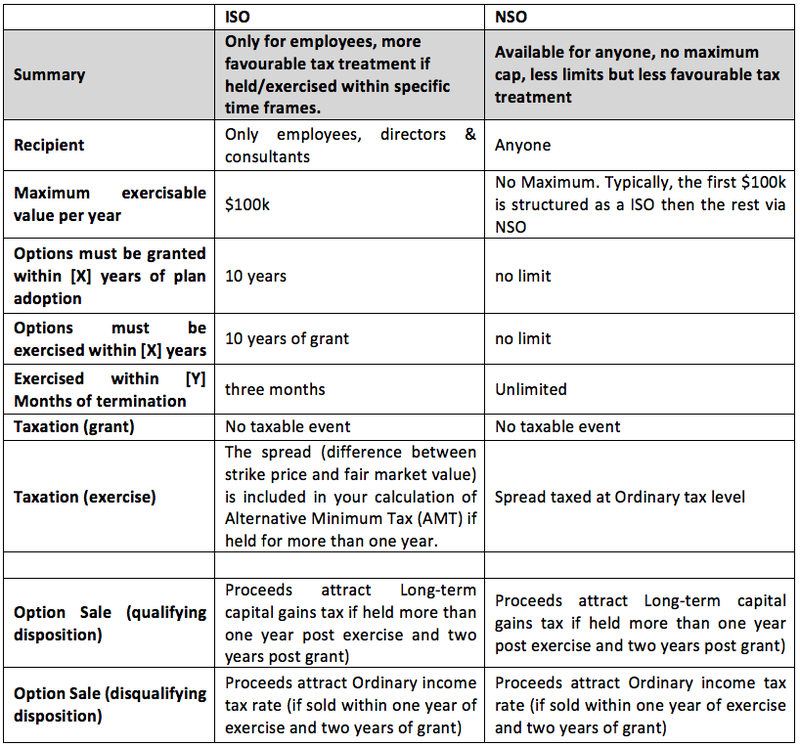 Employers looking to give employees more flexibility in exercising their option grants sometimes increase this period or convert the ISO to a NSO with no limits on when options must be exercised by. If an option is not exercised after three months of an employee leaving a company, it will no longer qualify as an ISO and will be treated as a NSO for tax purposes if the options do not expire anyway after three months. In the example of Pinterest and Quora where they extended the post-termination exercise window, these options automatically converted to a DSO after three months and employees were able to exercise options up to seven years after leaving the company. For example, some companies have said that for employees that have worked in the company for two years, they will have up to two years to exercise their options. This delays the point at which the employee will have to pay the strike price and tax when exercising options. Otherwise the tax bill can be significant given that the tax will be calculated on the spread, which may be very large on a fast-growing company and many employees will not be able to immediately cover this. This is especially important for companies where there may be a long period between the exercise of options and a potential liquidity event. A good worked example of this can be found in the YCombinator blog below. How many options should I give? Fred Wilson’s approach involves giving an employee a proportion of their salary in option grants. The number of shares is worked back from the “Best Value” which is often the valuation at the most recent funding round. Many companies choose to adjust the salary factor depending on how competitive the local hiring market e.g. some companies multiply the AVC factor by 1–3 x. Some companies will also look to trigger top-ups when vesting period nears the end as this is arguably when an employee is at their most valuable and most likely to consider leaving. If you have ex-employees holding shares, be mindful of information rights and any other complexity this may cause further down the line or at the point of exit. Understanding the relationship between UK and US option plans and ensuring that the pricing remains equal and culturally acceptable in each location. Guidance on how much equity to give advisors and template engagement docs put together by the Founders Institute and Orrick. Please send us your thoughts on the above and to highlight your own experiences if these differ from the above! Alternatively email me or Alliott directly. Thanks to Dan at Iovox, Daniel Glazer at Wilson Sonsini and Tony from Valuation Solutions for helping share your knowledge and experience on this topic. This blog and those in this series are aimed at helping entrepreneurs learn about the US market, what it takes to start here, and ultimately what it takes to succeed here. Many of the topics (if not all) are complex and it is best to view these blogs as a basic introduction from which you the entrepreneur must triangulate to your own specific set of circumstances — and invariably it will be sensible and appropriate to seek third party professional advice.